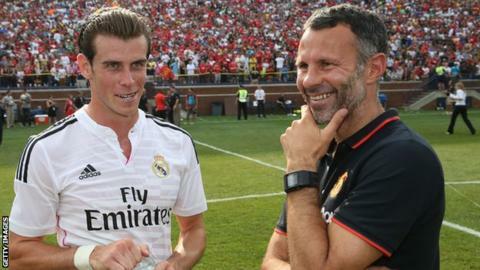 Former Wales captain Ryan Giggs says Real Madrid winger Gareth Bale can become the country's greatest ever player. Bale became the world's most expensive footballer in September 2013 when he joined Real Madrid from Spurs for £85m. Manchester United assistant manager Giggs, who played alongside Bale for Wales, believes the 25-year-old can become even better. "I think he could be the best," Giggs told BBC Radio Wales Sport. Bale played as Wales maintained their unbeaten start in the Euro 2016 qualifiers with a 2-1 win over Cyprus in Cardiff. John Charles, Ian Rush, Neville Southall and Giggs himself are considered Wales' greatest footballers. Cardiff-born Bale was a Copa del Rey and Champions League winner during his first season in Spain, scoring in both finals. Wales manager Chris Coleman believes Bale can overtake 73-cap legend Rush's 28-goal tally to become the nation's top scorer. Giggs, who ended his illustrious playing career with Manchester United at the end of last season, says Bale is performing consistently at the highest level. "He's playing at a great club and he's doing it week in week out and he's doing it for Wales as well," Giggs added. "He can be as good as he wants to be because he's such an amazing talent. He can go all the way. "Not only that he's a great lad who wants to get better and wants to be the best." Bale made his Wales debut as a 16-year-old against Trinidad & Tobago in May 2006, a year before Giggs called time on his international career. The former Southampton player has won 47 Wales caps and scored 14 goals - two more than Giggs netted in 64 appearances for the national side.